Date stamps allow you to easily mark the date on any stampable item. This becomes very useful—especially when numerous documents and items need dated. Traditional and self-inking line-daters and die-plate daters are available in a variety of sizes to meet all your marking needs. Die-Plate Dater and a Line-Dater ? 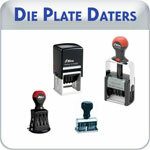 each date, a "Die-Plate Dater" is your best friend! These daters allow you to customize your date stamp. Browse traditional messages or create your own. a "Line-Dater" stamp is simple and easy.